"Treachery lurks within a heritage brandy making firm"
The return of the two winemaking detectives in lush French surroundings is, as always, a pleasure. Benjamin Cooker, the master vintner, and his assistant Virgile discover COGNAC CONSPIRACIES. The traditional brandy firm Lavoisier has been handed down to three siblings, but one of them has sold his share to China. Brandy is hugely valued in the Asian market and the Chinese firm investing, is calling a shareholders' meeting to see how best to profit from the situation. Marie- France Lavoisier, a mature beauty who has entertained politicians in her day, and her brother Pierre are disgusted by what they see as betrayal of the family. Cooker and Virgile accept the commission of assessing the heritage brandy producer and aiming it towards profitability. They find artisan methods instead of factory ones, a domineering pair of siblings and rare golden brandy to make the angels weep. Casks have been stored since the days of Napoleon, and nobody cares about the mildew on the storehouse ceiling, a traditional feature in old wine cellars. Tragically, the visit also finds a death on the premises. This is ruled an accident, but is the bad news too coincidental? Cooker had been about to cancel his dealings with the Chinese, on principle, but Virgile is now determined to discover the truth. As always the French country meals are amusing - a soup of garden snails and nettles is too good to resist, we are told - while fine dining proceeds in parallel. We also get to wander around the historic town of Cognac on the Charente river. The immersion in the surroundings is total, with scents of wild mint or cut fennel deepening the experience. Passions run high and love can last decades or turn to betrayal. I enjoy this Winemakers Detective series more with every book. 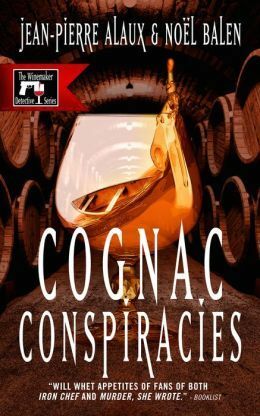 Jean Pierre Alaux and Noel Balen have outdone themselves with COGNAC CONSPIRACIES, expertly translated by Sally Pane. The wit, locations and characters of these books are to be savoured. The heirs to one of the oldest Cognac estates in France face a hostile takeover by foreign investors. Renowned wine expert Benjamin Cooker is called in to audit the books. In what he thought was a sleepy provincial town, he is stonewalled, crosses paths with his first love, and stands up to high-level state officials keen on controlling the buyout. Meanwhile, irresistible Virgile mingles with the local population until a drowning changes the stakes. A mere two hours earlier, internationally respected wine expert Benjamin Cooker had kissed his wife good-bye, swung by his offices on the All�es de Tourny in Bordeaux to pick up his assistant, Virgile Lanssien, and steered his Mercedes 280 SL toward the N10 highway. His destination was Jarnac, haut lieu of cognac production since the eighteen hundreds and birthplace of former French President Fran�ois Mitterand. When they arrived at the Ch�teau Floyras gate, however, no one came out to greet them. A woman's voice on the intercom informed them that they could park in the lot behind the wine warehouse. "The ch�teau is private property, and Miss Lavoisier is not seeing anyone at this time." Benjamin had not expected an overly warm reception, but to be so summarily dismissed surprised him. Virgile was clearly annoyed. "Boss, who do they think we are: bulls in a china shop?" "Thank goodness they didn't set the dogs on us," Benjamin grumbled as he parked his convertible in the shade of an ash tree with large drooping limbs. "I have the feeling, sir, that the only bows we'll be getting here will be from the trees!" "That sums it up pretty well, my boy. I am expecting the worst. That way, I won't be disappointed." Virgile jumped out of the car, his shirt wrinkled and his hair disheveled. The trip had been rather long, and his boss's driving was far from smooth. "Don't forget your jacket. And fix your getup. Straighten the collar and button the shirt. A little decorum, please! You'll need to use your charm to reassure the mistress of the house." Virgile smoothed his hair and straightened his shirt. His slipped on his jacket, even though he was already feeling too warm. The early May weather tempted him to take off a layer or two, whereas Benjamin was ever faithful to his Loden, his oxford shirts, and, on this morning, his fedora, which gave him the air of an aging dandy. "Always very fashionable, boss," his assistant said, looking him over. "�The boor covers himself, the rich man or the fool adorns himself, and the gentleman gets dressed.' Consider yourself counseled!" "Those are not your words, Mr. Cooker." "That's right. Honor� de Balzac." "Ah, yes, the guy who became disillusioned." "You never cease to surprise me, Virgile." They found their way to the office, which was dominated by a tall wooden staircase that smelled of polish and ambrosia. On the walls, old advertisements extolled the merits of Lavoisier Cognacs with slogans reminiscent of Radio Paris during the Vichy regime. The yellowed posters read "Lavoisier Cognac? Like velvet on the throat!" and "There is nothing more distinguished than Lavoisier Cognac!" "Cheesy," Virgile whispered, and Benjamin put a finger to his lips. They heard footsteps coming down the stairs. An elegant-looking man appeared in a tweed vest, bottle-green corduroy slacks, and a cashmere sweater. He was holding a golden-colored flask. "Pierre Lavoisier. Mr. Cooker, I presume?" Benjamin shook his hand and said, "This is my associate, Virgile Lanssien." The man, who appeared to be in his forties, adjusted his gold-rimmed glasses and gave the winemaker's assistant a thorough look-over before moving his lips almost imperceptibly. It was difficult to tell whether he was smiling or brooding. "Beauty is the promise of happiness, is it not?" "That's exactly what Stendhal said," replied Benjamin, always confident of his literary knowledge. Pierre Lavoisier began to tremble ever so slightly, and sweat beads formed on his forehead. So, Benjamin thought, he didn't know how to play this game. Arrogance was not his m�tier, much less pedantry. "My sister will see you, if you will kindly wait here," was all that he said before leaving. "Have a seat, please." "We're not really tired," Benjamin responded as he inspected a large lithograph of Jarnac in 1830. The winemaker, a connoisseur of antiques and an occasional historian, reached for his glasses. With great interest, he examined this panoramic view of a former chateau, which had been sacrificed for a suspension bridge spanning the Charente River. On the embankments, imposing homes reflected the good fortune of their owners. Along the river's edge, only a few trees dared to tip their boughs, lest they hinder the passage of the barges. Benjamin took a few steps back to better appreciate it and then turned his attention to a family photo. He recognized Pierre, standing proudly next to a beautiful woman with blonde hair. Seated in front of them was an elderly man—presumably the patriarch. Off to one side was another man, whom Benjamin presumed was the infamous Claude-Henri. "Strange, very strange," Benjamin mumbled. Virgile wasn't paying much attention. He was busy staring out the window at this Pierre, who had undressed him with his eyes, like a slave trader. "There's something suspicious about him." "I'm saying that he's strange, too." The door opened, and Marie-France entered the room. She was wearing a pink silk suit that complemented her astonishingly radiant complexion. Her wrists and neck were unadorned, but she had several extravagant diamond, sapphire, and ruby rings on her fingers. Her handshake was firm and formal. Ms. Lavoisier knew how to hold her own. "So, gentlemen, what can I do for you?" Benjamin shot a glance at his assistant before tactfully and a bit solemnly explaining the assignment he had been given. He confessed that he had not met his client, Shiyi Cheng, in person. "We have only exchanged correspondence," the winemaker said, hoping to gain a semblance of consideration from Lavoisier. Her pale eyes were making him uneasy. "I believe your shareholder simply wishes to know the status of the accounts." "I don't have to tell you that there are certified public accountants for that, Mr. Cooker." She lashed out his name, and Benjamin could almost hear a whip cracking. Then her eyes fell on Virgile. She stared not at his face, but at his body, from sternum to crotch. Benjamin could feel his assistant's embarrassment. Virgile crossed his legs and pulled himself straighter in his chair as she continued her indecent and perverse inspection. Benjamin tried to correct himself. "Perhaps I did not make myself clear, Ms. Lavoisier. Our assignment has more to do with how we can help the company evolve. We're here to study the business. Cognac is going through difficult times. I hope, in the framework of this mission, you will consider us allies, rather than enemies." "You can be sure, sir, that I have always chosen my allies, and I don't let anyone impose them on me. Allow me to point out that your so-called mission is in no way endorsed by the Lavoisier Cognacs Board of Directors. I could throw you out, but I have too much respect for your knowledge and skills, which I know are extensive. However, Mr. Cooker, I strongly advise you not to overstep the bounds of what you call—what was it again?—your study and what we should or should not be doing to further this proposed evolution of our company." Benjamin refused to be deterred. He employed the persuasive—and clever—diplomacy that he was known for. "Thank you, Ms. Lavoisier, for your valuable cooperation. We will try, my associate and I, to do nothing to hinder your work, and we will foster the best possible atmosphere for a profitable collaboration. Isn't that right, Virgile?" Marie-France Lavoisier studied the young man with the eyes of a raptor ready to dismember its carrion. Virgile, clearly aware that he was almost in the clutches of this femme fatale, managed only a stammered response: "Ma'am, our... our...interests are mutual." "Mutual? You're getting ahead of yourself, my boy. Allow me this familiarity, because you could be my son." "I take that as a compliment, ma'am." "Marie-France." The woman corrected Virgile with a sweet and poisonous smile. Virgile thrust out his chest a bit, and one of his shirt buttons came undone. Benjamin glimpsed a bit of tanned skin and pectoral muscle. Marie-France crossed and uncrossed her legs. Benjamin pretended that he hadn't seen a thing.